A three-game winning streak that the boys varsity basketball team enjoyed was broken last Friday night, January 27, as the visiting Southold team posted a 46–40 win. It was a highly contested game through all four quarters but the defensive battle was won by Southold. During the first half, the Shelter Island team shot extremely well from both the foul line, making 8 of 10, and from behind the arc, making 3 of 3. Unfortunately, the team struggled from inside the arc (the 2-point area), connecting on only 5 of 25 attempts. Sophomore Nathan Mundy scored 10 of the team’s 27 points during the opening half of play. Junior Chandler Olinkiewicz hit a big buzzer-beating shot to cut Southold’s lead to just two points (29–27). The Indians’ shooting woes continued in the second half, converting on just 4 of 24 shots from the field. Credit both defense and poor shot selection for the 5-to-2 advantage that Southold gained during the third quarter. On the flip side of the coin, the Indians shot a season-high 86 percent from the foul line (12 of 14) and 57 percent from behind the 3-point line (4 of 7). Unfortunately, there were just too many scoring opportunities inside the lane that didn’t produce any points. The players know this has become an issue for the team. Hopefully, the returning players on both the JV and varsity teams will be involved in a weight training program during the off-season. Our players must become stronger and more physical if they are to battle underneath the basket. In short, the coaches know that we need to become a more “physical” team as well as to build on our overall athletic abilities. Southold’s 1-3-1 zone really disrupted the Indians’ offensive game plan. Senior Jimmy Read once again led the team with 10 rebounds, with junior Myles Clark grabbing 7 rebounds as well. Nathan Mundy was high scorer with 14 points but was not as consistent as he has been in the past. Coach Mike Mundy said that his team played hard but missed some great scoring opportunities down the fourth quarter stretch. Coach Mundy said the team needs to have better shot selection, find the open man, move the ball quicker and learn to finish, especially in and around the basket. The team, he said, is very optimistic that it has improved and will continue to improve throughout the remainder of the season. Both the girls and boys varsity teams will be traveling to the Ross School on Friday, February 3 for a rare doubleheader. The girls will be playing at 4:30 p.m. and the boys at 6:15 p.m. The teams would like to thank the fans for the wonderful support throughout the winter season. The Shelter Island boys junior varsity basketball team earned its second victory of the season on the road on Friday, January 13, beating Stony Brook on its own court, 44-35. The Indians fell behind early, trailing 13-4 at the end of the first quarter. It was then that Coach Jay Card inserted sophomore Riley Willumsen into the game. Riley had suffered a hip injury about three weeks earlier that had kept him out of the line-up. His presence on the court made all the difference. The Indians outscored their opponents 40-22 during the final three quarters, including a pivotal 14-0 run in the final quarter. No one benefited more from Riley’s return than sophomore guard and co-captain Drew Garrison. Riley assumed point guard duties and Drew was moved over to the number-two guard or shooting guard spot. Drew responded with a game-high 18 points, scoring them all after the first quarter. He converted on four 3-point shots and found his confidence and shooting stroke. Carter Brigham hit some key baskets, scoring 8 points. Although Matt Dunning had only 4 points, his rebounding, defense and assists were all important factors in helping his team to victory. Freshman Sawyer Clark has continued to develop, both on the offensive and defensive ends of the court. Sawyer scored 7 points and hit two big free throws at crunch time. The team went a perfect 6 for 6 from the free throw line late in the 4th quarter. The Indians played tough defense and held Stony Brook scoreless during the 4th quarter. Coach Card said he was extremely pleased with his team’s performance and the players’ unselfish attitude, which was particular evident from his bench players, Bac Tran, Matt Murphy and Johnny Sturges, who all played and contributed in this big win. In the second game of a home doubleheader on Friday, the boys varsity basketball team got off to a rough start, falling behind 20-4 in the first quarter against a talented Ross team. They kept the gap from yawning too much wider and finished the game with a final score of 70-45. They were down by 8 more points at halftime. Coach Mike Mundy went with a smaller but quicker line-up during most of the third and fourth quarters. The team enjoyed some success by pressing Ross and picking up the tempo, both defensively and offensively. Twelve of the team’s 18 turnovers occurred in the first half, which limited the team’s scoring opportunities. The defensive effort in the first half was poor. Once again, senior tri-captain Jimmy Read was the team’s high scorer with 17 points. He also led the team in rebounding with 10 boards. Teammates Nathan Mundy (8), Matthew BeltCappellino (7) and Myles Clark (6) combined for 21 points. Junior Hunter Starzee contributed 4 points and 4 rebounds. Junior varsity co-captain Drew Garrison made the most of his varsity debut by connecting on his only 3-point attempt. Coach Mundy credited Ross for their strong play at both ends of the court. He said he was also confident that his team will continue to learn from mistakes and practice with more intensity and confidence. Time will tell if the players consistently adopt that philosophy. There are no “easy wins” on the remaining schedule but the team is determined to work hard and to find a starting line-up that can match up better with quicker teams, Coach Mundy said. The boys varsity basketball team traveled to Sag Harbor Tuesday to take on the Whalers. Coach Mike Mundy told his players that they needed to compete with “more heart and hustle” at Monday’s practice. The varsity team had been struggling both offensively and defensively in its previous three games. Apparently, the “heart-to-heart talk” paid off and the Indians came ready to play. Although the team trailed 13-9 at the end of the first quarter, it was very clear that all eight team members were determined to play hard and take pride in wearing the Shelter Island uniform. Each one scored and played solid defense throughout the game. The Indians enjoyed a brief lead late in the second quarter, holding the Whalers scoreless for more than 7 minutes. Nevertheless, the score was tied at halftime 17 all. The mood in the locker room at halftime was positive and the players realized that their efforts were paying big dividends on the court. During the second half, the Indians fought back and enjoyed a 3 point lead, 28–25, by the end of the third quarter. Senior tri-captain Alex Graffagnino hit a huge 3-point shot and then converted both free throws on the next Indian possession to put the team back on top 35–30. The team committed several critical turnovers late in the game, which proved costly. The score remained close until the final minute of play; the Whalers earned a 45–41 victory on their home court. The Indians were led by senior tri-captain Jimmy Read, who had a team high of 8 rebounds, 3 steals and 5 assists. He also contributed 7 points. The team scoring leader for the second time this season was junior center/forward Wyatt Brigham, who had 11 points. The players know that they need to work extremely hard at both ends of the court and cut down on turnovers in order to be successful this year. But the effort they put into this game should serve as a building block. The next game is on Friday, January 6, at home against Ross School. Both the girls varsity at 4 p.m. and boys varsity at 5:45 p.m. will be in a rare doubleheader against Ross. Hopefully, the hometown fans will be out in force to support their two varsity teams. 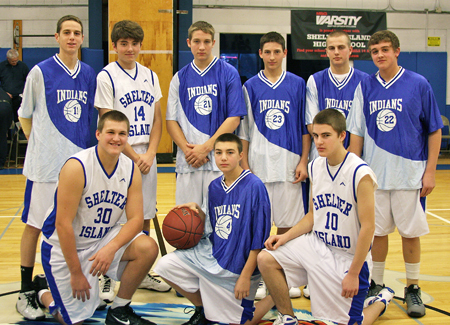 JIM COLLIGAN PHOTO | The Shelter Island varsity basketball team before their first contest of the season, a non-league match-up with East Rockaway: standing, from left, Jim Read, Wyatt Brigham, Aaron Johnson, Miles Clark, Matthew BeltCappellino and Hunter Starzee; kneeling, Chandler Olinkiewicz, Alex Graffagnino and Nathan Mundy. The Shelter Island varsity boys basketball team outshot their opponent in the fourth quarter of their first league game of the season on Friday, December 16 in Southold but it wasn’t enough to make up for poor results shooting from the foul line and two players benched for academic ineligibility. The Indians lost to the Settlers 70-52. “We were five for 21 from the foul line,” said Coach Mike Mundy. “That’s 16 points right there. If we’d had 10 out of those 16, we would have had a real game on our hands,” he said. The final score would have been 70-49 but Matthew BeltCappellino sunk a 60-footer at the buzzer. He also scored 3 points at the buzzer at the end of the first half. He was the highest scorer for the Indians with 14 points, followed by Wyatt Brigham with 11. “He came on real strong and took up the slack for the ineligibles,” Coach Mundy said. Jim Read and Hunter Starzee each scored 8; Nathan Mundy scored 6 and Miles Clark 5. The Indians play next at Mercy in a non-league game on Wednesday, December 28. The next game after that isn’t until January 6. Coach Mundy said it was team policy that any player failing a course was ineligible. The Indians played their traditional non-league season starter on December 11 when East Rockaway came east and won 62-22. Coach Mundy said the city team was “out of our league” but its coach likes to bring out his players for a positive experience “and for us it’s a chance to see a real good program” in a small school. With only one game played in League 8, Southold, Ross, Stony Brook and Pierson top the standings with one win and no losses while Shelter Island, Greenport and Bridgehampton trail with one loss and no wins each.